We left Munich on a nice day, some clouds, no rain and headed toward Switzerland and the Alps. 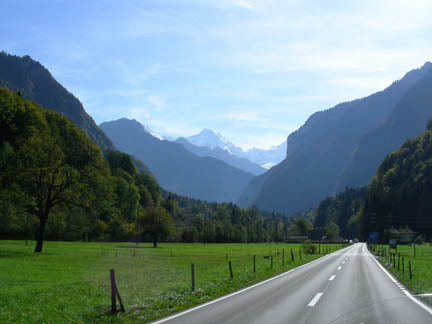 We traveled south toward Lichtenstein, Austria and Switzerland where we bought our highway permits. Both Austria and Switzerland require a permit to travel on their Autobahns (limited access freeways), making their whole system toll roads without toll booths. 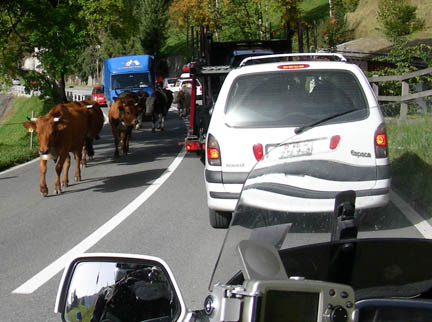 We were heading to Zurich first to meet with Hubi, a representative of the Ex-Ped Company. The ExPed company makes camping gear including a very comfortable sleeping pad. We bought two of them last spring to replace our Thermarest pads. The ExPed's are thicker, more comfortable and warmer and don't take up any more room than the Thermarest pads. Kathy's pad had started leaking through some very small holes and I had emailed the company and told them about the problem and that we would be nearby. Hubi replied that we should stop in and see him, so we did. After a quick look at the pads, Hubi replaced both of them. I couldn't have asked for better customer service. I highly recommend the sleeping pads and the company. Much of Switzerland is flat bottomed valleys with very steep sides. Getting to Zurich we followed the valleys and on leaving we started our first ascent up switchback after switchback. At least here we had guardrails. Our destination is the Jungfrau, a mountain peak with a cog railway to the top and spectacular views all around. 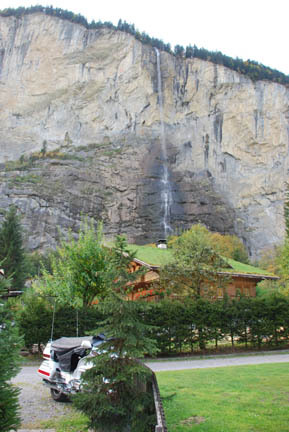 That night we camped in an Alpine valley near the town of Lauterbrunnen. The campground was at the base of a waterfall and surrounded by beautiful scenery. The sun was out and the fall colors were great. This town was the start of the railway to the top. The nights were cool and we planned to stay for two nights so Kathy wanted to rent a cabin instead of staying in the tent, so we did. This is the view from our porch. The bike is half hid behind the small tree and the waterfall was in plain sight. When I paid for the cabin I also bought tickets for the train ride, 130 SF (Swiss Franks) each (a little over $100 US dollars each). That evening we were sitting on our patio talking with an Australian couple from the next door cabin. After dark, about 9:00 pm it started to lightly rain, so we parted company and went into our cabins. The rain got harder and harder. The next morning it was still raining, but we had paid tickets for a specific train and put on our raingear and headed for the station. 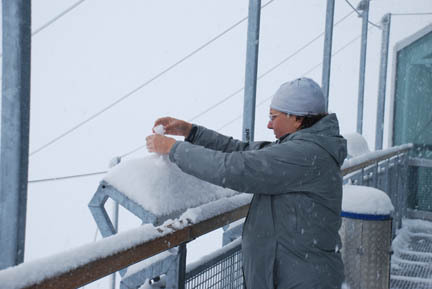 It continued to rain all the way to the top where there is a blizzard blowing! The temperature is -2 C (about 28 F) and the wind speed is gusting to 65 km. (about 40 mph). And we can't see anything! 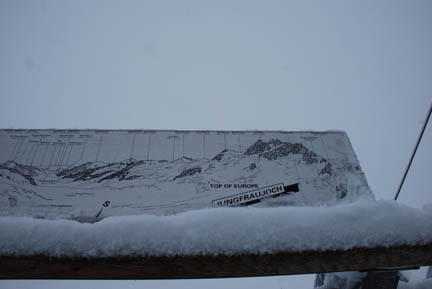 I wiped the snow off the etched metal plate describing the view but none of it is visible. And we paid over $200 dollars for this!!! We spent about an hour at the top and headed back down. 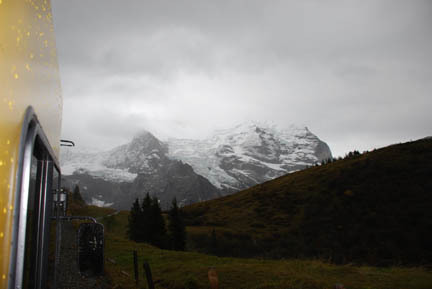 On the way down we could, at times, see under the clouds and rain to the lower slopes of the Jungfrau. The train stopped at a couple of villages on the route and we got off and explored them. In general they were pretty but the weather was keeping everyone inside. So we gave up and went back to the cabin and waited. About mid-afternoon the rain stopped but the cloud cover kept the valley shut in. 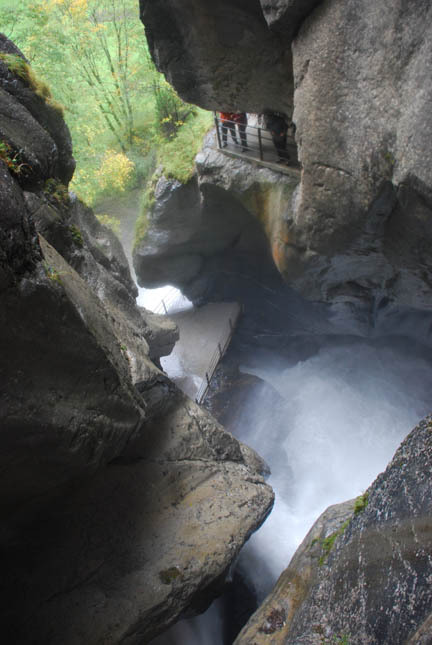 We decided to go see the Trummelbach Falls. This is one of the waterfalls that falls into the valley from the side (like the one in front of our cabin). Except this waterfall has eroded its way back into the cliff face leaving a very narrow curving channel that it churns through for a combined drop of about 400 feet. 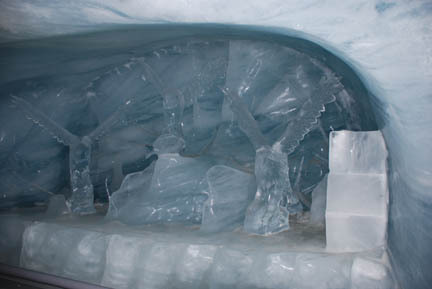 This is the stream of water from the glacier with the Ice Palace in it. Being glacial water it has a lot of finely ground rock in it. It is this rock, acting like sandpaper, that has eroded the waterfall back into the cliff face. The owners have tunneled into the rock and put in an elevator that takes you to the top of a trail tunneled out of the rock leading back down. 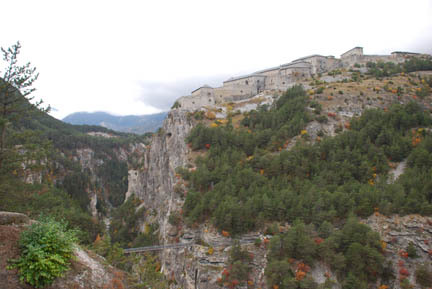 At intervals it has platforms that look into the twisting canyon at the waterfall. The fall is not continuous, it falls and churns through the twisting slot in a series of spectacular falls. Especially with the rain in the last 24 hours, it is very active and noisy. Many of the falls are inside the rock, as if in a cave. We could see the falls in the dim light filtering down the canyon from above but all my pictures in there have so much spray in the scene as to make it impossible to pick out the falls. It is a good thing we still had all our rain gear on. Our jackets and pants were running with water when we came out. 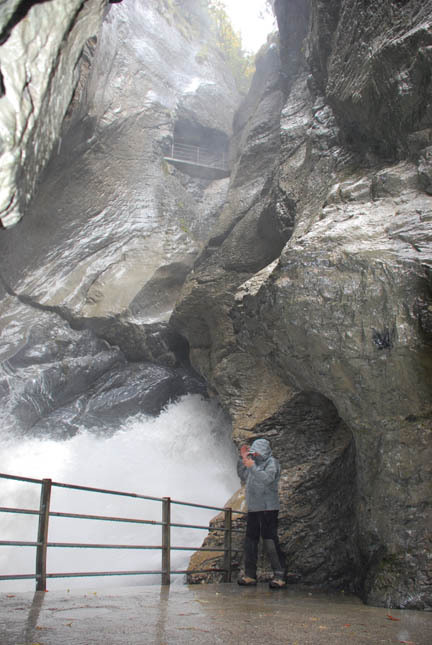 The picture at the left is near the bottom where the canyon has widened out and has two of the viewing platforms visible, one with people on it and one below them. This picture was taken from the bottom platform in the picture above and shows the platform it was taken from. We spent about an hour in the falls and enjoyed it and it only cost 11 SF each. The following day dawned bright and clear and we complained about our luck at the Jungfrau and headed south again. We are going to start running the passes. 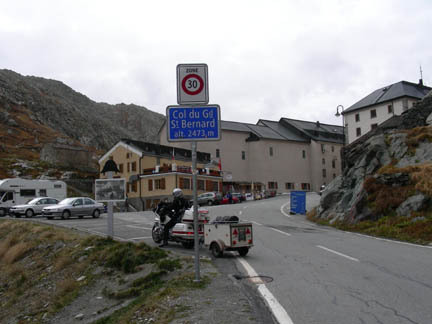 Our first destination is Grand St. Bernard. There is also a Petit St. Bernard. These passes are where the monks raised and trained the famous St. Bernard dogs to rescue travelers stranded in the passes. This was long before the invention of motor vehicles. 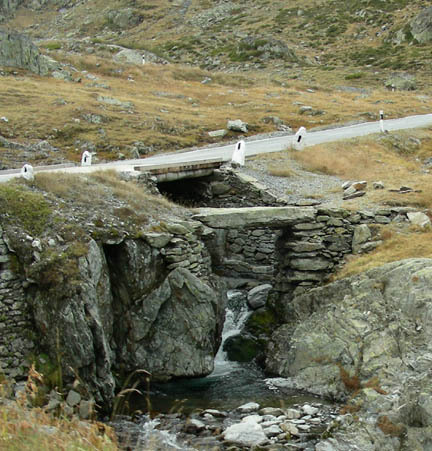 Grand St. Bernard pass was an important pass for the Romans. They used it to access their lands in Germany and surrounding areas. There are still pieces of their road left today. This bridge (the stone in the lower front) was on that road, but I don't know if it dates from Roman times or is a later addition. We spent the next three days running through about a dozen passes and through nearly that many gorges. Much of the time we were above the tree line on a narrow (1 to 1 1/2 lane) roads that twisted and ran through switchbacks up and down the mountains. 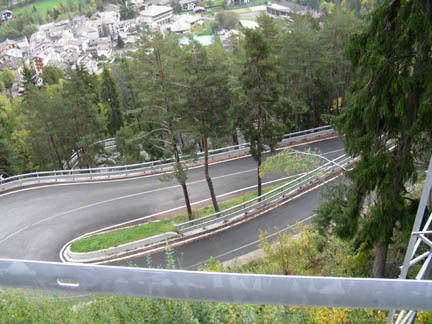 There was often no guardrail and if you left the road, there was nothing to stop you from rolling to the bottom, one or two thousand feet down. 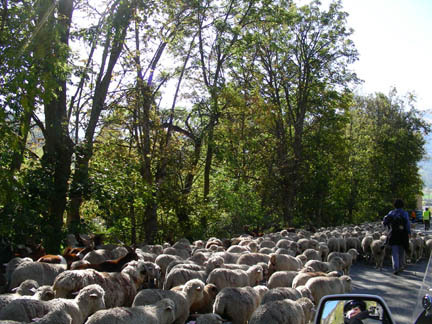 As we passed through some of the valleys the locals were bringing the herds down from the high meadows for the winter. We passed ancient forts that guarded the narrow spots in the valley bottoms in past times. 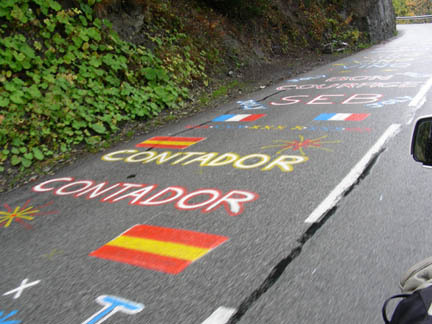 We climbed some of the same passes as the "Tour de France", but not at the same time. 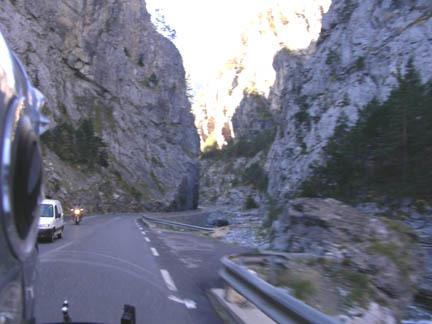 Then down through gorges with the road notched into the cliff face. 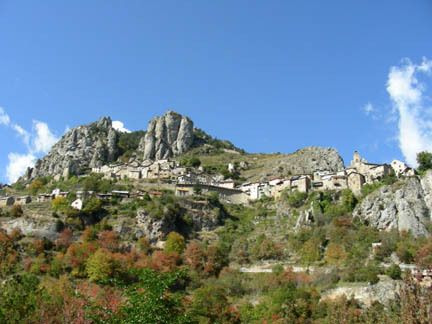 We passed small villages dating from Medieval times (this one is named Roubion) perched precariously on a steep slope high on the mountain side. What these people did to survive is beyond me. There was no sign of farming, just some garden plots, and no sign of herding in this area. And in the winter it would have been long and cold. 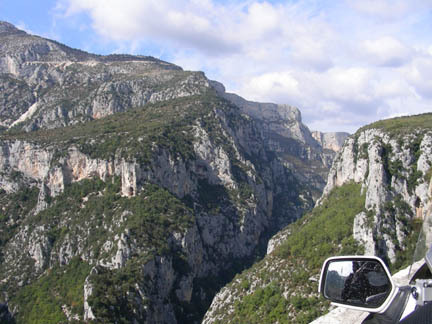 We were near what is called Europe's Grand Canyon, the Gorges de Verdon, so we went and looked at it too. It is much more accessible than the USA Grand Canyon with roads cut into the cliffs along the sides. It is also quite different in style. The rock is harder and this gives steeper sides that drop from the top to the water without the terracing that is in the USA Grand Canyon. You can see the road near the top on the other side. We took both roads and saw it all. An all day trip on narrow roads but, again, spectacular. After three days of this, with the cool nights and warm days mixed with the occasional shower we had worked our way through Switzerland, into Italy and then into France. We are almost to the Mediterranean and have decided we want warmer weather. So we headed for Italy and the Cinque Terre.